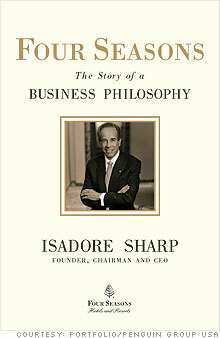 Isadore Sharp started the Four Seasons chain with a motor lodge in 1961. 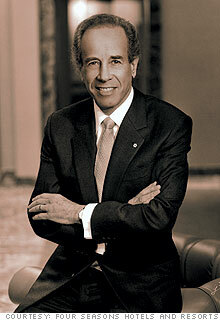 NEW YORK� (Fortune) -- After spending nearly five decades building the Four Seasons Hotels out of a motor lodge he started in 1961, Four Seasons founder and CEO Isadore Sharp is telling his story. It's captured in his new book, "Four Seasons: The Story of a Business Philosophy," which hit bookstores this week. Fortune contributor Sheridan Prasso got a preview from the Toronto-based hotelier when he spoke to her about the state of his industry, what he sees ahead, and how he formed his own business philosophy. The bottom line: The hospitality industry may be experiencing occupancy rate drops of around 15 percent or more, but Sharp's been here before, and he predicts all will return to normal without permanent repercussions. We've been through many recessions before. Yes, this is probably more extreme because it's unprecedented in its extent. But you go through the same way of running your business, knowing that these things do happen, and you are prepared for them so that you're not taken by surprise. Therefore in the development process we are in, there will be delays. There could be the odd [hotel] that might not go ahead because of weak financing. But generally everything just keeps moving, maybe just at a slower pace. By the time this recession is over, hotels that are ready to open will be open in the good times. What development are you planning? Over the next 10 years we have a robust pipeline of opportunities that will easily see the company double the number of hotels [from 83 currently]. Today we have 40,000 employees, and we expect to grow to 80,000. At present we have more than 50 hotels under one form of development or another. We've had a couple delays - a hotel in Kazakhstan, and in Montenegro. New York [scheduled to open in 2011 in the Financial District] might be postponed, deferred, but not stopped. What's the current state of the luxury travel industry? When people are traveling now, it's not luxury they're looking for; it's convenience and efficiency of use of their time. That's really what we're selling. So yes, today there's sort of a perception that maybe staying in more exotic places gets pushed to the back burner. But by nature, people don't go backwards in lifestyle. As things settle down, people will get back to their normal way of doing business. That has been our experience every time we go through this economic re-cycle. I call it a re-cycle, because it keeps coming around. No, not at all. This is a major growth industry, one of the world's biggest in terms of revenue generated and employees. So not at all. I think we're just scraping the surface of what the industry will become. Large numbers of people are coming into this market over the next 10 years - in India, Asia, China, Latin America, countries that were held back a bit and are now moving well into the free market. There's going to be an enormous swelling of business growth. Business growth connects directly to travel. No matter how good technology is, you can't conduct business by talking over the phone. Are you lowering prices in the meantime? Not discounting as much as packaging opportunities. When you travel you might stay four days and only be charged for three. That does work. You're 77 now. What are your retirement and succession plans? As long as I feel I can add value, I will continue doing what I'm doing. Fortunately I'm in good health. We always have plans in place for succession, both the unexpected and the expected. I don't want to put a timeframe to it. When we went private, I undertook that I would definitely stay on for at least three years, and after that it's my choice. That was two years ago. Katie Taylor has been appointed as chief operating officer. In the framework we have now, that's a role that would ultimately end up with her becoming CEO. But there's no immediacy to that. You started the Four Seasons as a motor lodge. How did you develop into a five-star hotel? It was called the Four Seasons Motor Hotel, in 1961. To get the first one built took me about five years to convince people. I didn't know anything about the hotel business. I'm a builder by trade. It was just another real estate deal. But after we built and opened the Inn on the Park in London, that's when I really saw an opportunity. So that's what set the pattern and statement of what I call the first major strategic objective - that we would only operate medium-sized hotels of exceptional quality, and we're going to try to be the best. That was in 1972, 11 years after the first hotel opened. That was the beginning of the Four Seasons. And McDonald's served as a business inspiration for you? How? When I decided, "We're going to be the best," what did that mean? How do you become the best? I figured it wouldn't mean through the architecture and d�cor, but through the quality of our service. I thought if we could make service so special and meet customer needs, that would differentiate us. My friend was the president of McDonald's in Canada. This was 45 years ago, but whenever you went into a McDonald's, they always had a pleasant approach. The experience was always as expected. So I had a day at McDonald's. I sat in on a training session. What interested me was that they had a film and training literature that must have been 15-to-20 years old. It occurred to me that if you have something that people can understand, identify with, you don't have to change it. That's when I thought that we would use the Golden Rule as the basis for creating our mission statement. How did being the son of Polish Jews who fled pre-Holocaust Europe play a role? I think most children who come out of immigrant homes grow up in a household where the parents are very hardworking, very loving. Those values you learn emotionally are what make you and stick with you. My father emigrated from the pogroms in Poland to [what would later become the state of] Israel, where he helped develop the first Kibbutz. He became a builder. They were called pioneers, with their purpose and cause to create a country from scratch. I gleaned and learned a great deal from him. He studied Torah, but he didn't demand that we follow the dictums. He had an open mind [and lived by] the Golden Rule. That's what I carried into my work life. So what's your favorite Four Seasons Hotel? The hotel I'm in becomes the favorite of the day, because it is. I stay in 25 to 30 hotels a year. Now if you ask me what is the most important hotel, I'd say the Inn at the Park in London, which to this day has to be considered the most important, most profitable, and made enough money to pay for my mistakes and set the course for what we're doing today.